It is well documented on my blog and in my classroom how much I love bacon. I have had students bring me bacon mints (which were gross and tasted like band-aids), chocolate covered bacon (delicious!) and a maple bacon cupcake (also delicious). At the beginning of second hour yesterday, one of my students came up to me and said, "Mrs. Shaum, I brought you a piece of maple bacon saltwater taffy." I looked dubiously at the pink and brown piece of candy in its translucent wrapping. My students, in turn, looked at me expectantly. So I opened the wrapper, popped it in my mouth and ate it right in front of them. As I chewed, and chewed.... and chewed, thinking while I was chewing, the room was completely silent as they patiently waited for my assessment. I noted the maple taste right away but couldn't really note much bacon flavor. Instead, it tasted more like salty maple saltwater taffy, which was pretty darn good. As I declared to the class that I liked it, they all erupted in cheers. Love saltwater taffy but bacon??? If you want to win on Top Chef, make something crazy with bacon. Too funny! 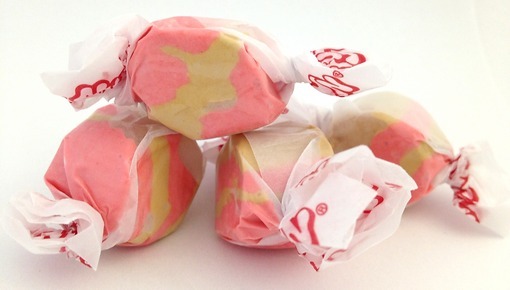 We were at the beach recently and one candy shop had some seriously odd (er, unique) flavors, including chipotle pepper taffy. It was interesting to taste once but I don't think I'd go out of my way to get it again. Maple is always good, though! Hummm -- I love bacon but haven't had it in candy . . . yet. someone gave me some bacon peanut brittle once. I was not really a fan. You should head up to Clare and try the Squealers at Cops & Doughnuts. Unfilled longjohn style doughnuts, topped with a maple icing and a strip of bacon. So good! I had a bacon caramel once and it was nasty. Glad I found your blog! What fun!